LA LOCHE, Sask. 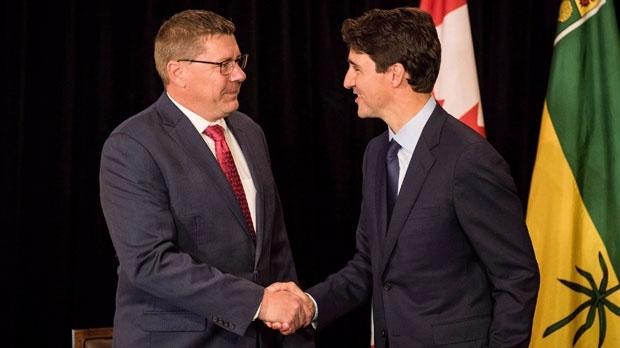 - Prime Minister Justin Trudeau says he continues to work with Saskatchewan Premier Scott Moe despite their differences over the federal carbon tax. Trudeau was asked at a funding announcement in La Loche whether he would try to persuade Moe, who was also there, about the tax. Trudeau said he and Moe have had "many great conversations" on things they agree and disagree on. The two did not meet when Trudeau was in Regina earlier this month. Trudeau said it was good to meet the premier in La Loche and added that they will continue to work on issues that matter to Saskatchewan. Moe, who said they only met briefly, and discussed supports both governments are providing to communities.